I just realized something. Maker’s Mark spells ‘whiskey’ without the ‘E’. There it is — clear as day in the picture. How have I never noticed this before? Have they been spelling it wrong the whole time? Have I been spelling it wrong the whole time? Is someone playing a trick on me? It’s unusual that something like this sneaks up on me. As someone who gets paid to sling words in the ad world for a living, I spend an obscene amount of time debating the best way to say something. It’s silly, really. If the average person knew how much time and money went into the TV commercial they just saw, or the banner ad they just read, or the poster at the grocery store that encouraged them buy an item that wasn’t on their shopping list, they’d be shocked. Heck, sometimes I wish I didn’t know. But believe me when I say that each and every word was written with a purpose. Then scrutinized 100 times by 100 different people. And then, if you’re lucky, some version of what you originally intended ends up being seen by the world. So perhaps, at one time, the people at Maker’s Mark had a similar conversation about how their brand should spell ‘whiskey.’ In fact, I can almost guarantee it. 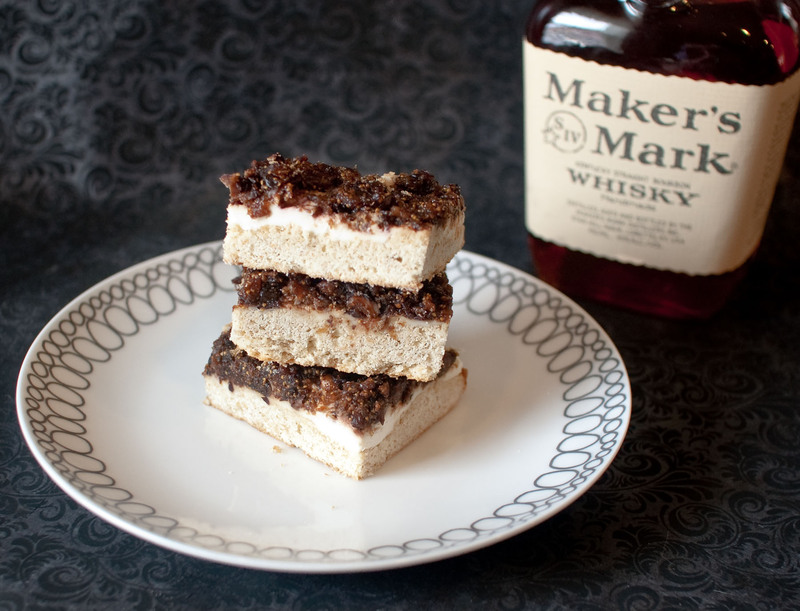 But regardless of whether you spell it with an ‘E’ or not, you can still enjoy your whiskey and eat it to with these whiskey-soaked fig and cream cheese cookie bars. For adults only, of course. What’s your preferred spelling of whiskey? Preheat the oven to 375 degrees. Grease a 9″ x 13″ baking pan. Set aside. In a large bowl, beat the butter and the sugar with an electric mixer until fluffy. Add the egg and vanilla and beat until incorporated. In a small bowl, sift together flours, baking powder and salt. Add half the flour mixture to the butter mixture and beat until well combined. Add half the milk, beat for about 10 seconds, then add the rest of the flour and the rest of the milk. Beat for a few seconds to fully combine. Put batter into your prepared pan and bake for 20 minutes or until the edges of the cookies are browned. Remove from oven and let cool. Meanwhile, in a small saucepan, heat the whiskey over medium heat until it starts to steam. (Be careful when using alcohol over a flame!) Turn off the heat, add the figs, and cover — letting the figs soak for about 10 to 15 minutes. Drain the soaked figs, reserving some of the liquid. Add the figs and the cinnamon to a food processor and blitz until smooth and spreadable. Add the liquid (a little at a time) as necessary to help thin it out. Spread softened cream cheese over the cookie bars, then top with the fig mixture. Refrigerate the bars to let them set before cutting. Hey Annie! That’s interesting. Thanks for the info. This sounds so good.. I like everything soaked in alcohol and used for sweets! I take it these are a newer version of millionaires shortbread. Which is great as I had a situation as I child that put me off them for life. I’ll be making some of these. I have always spelled it with an ‘e’ and never noticed the non-e version! i seriously just ran to the kitchen to check my maker’s mark…. and took a swig while i was at it. i sure like whisky. that looks wrong. i don’t care what my bottle says… although i do have a different label than you do. weird. p.s. how much do i love you for soaking figs in booze? This is great. I love little memory tricks like this. Thanks for sharing. The fig toppings are very interesting. I can’t wait to make this for my husband. This would make him happy!